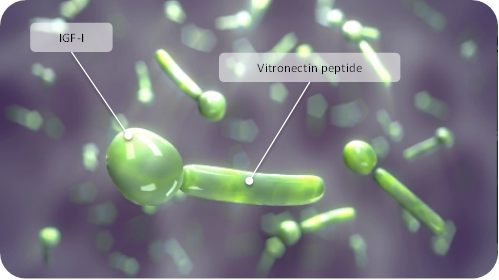 VitroGro® ECM is a synthetic matrix protein comprising a portion of vitronectin and IGF-1. The type of cell proliferation and migration that wound healing relies upon is anchorage dependent. In the absence of a matrix, there would be no basis for the attachment of cells, hence no cell migration and proliferation and subsequently no wound healing. Therefore the physical surface matrix of VitroGro ECM is needed to restore wound healing. Whilst an intact ECM is essential for wound healing, chronic wounds have been shown to comprise senescent (no longer capable of dividing but still alive) fibroblasts (Telgenhoff et al 2005) as well as keratinocytes with decreased migration and proliferation (Pastar et al 2014). [1 and 2] The IGF-1 functions clinically manifest in an ulcer as wound area reduction as the epithelial cells migrate over the wound surface to close the wound, ulcer volume reduction, capillary formation and granulation tissue formation. Wound healing requires fibroblasts and keratinocytes and anchorage is important for cell migration and proliferation. Fibroblasts and keratinocytes are key cells that must colonise the ulcer for healing to occur. These cells need adhesion and sensecent cells in the ulcer require activation. Because chronic venous leg ulcers are in a stalled state and have a defective matrix, the product rationale involves cells getting a foothold in the wound by virtue of the vitronectin component, and once there the IGF-1 component supports migration and proliferation. Not every type of acne treatment works the same for every person. Find out how buy accutane, it may work best for your acne. Telgenhoff D and Shroot B. Cellular senescence mechanisms in chronic wound healing. Cell Death Differ. 2005. Pastar I, et. al. Epithelialization in Wound Healing: A Comprehensive Review. Adv Wound Care. 2014.